As ICE continues to ramp up its inhumane surveillance and detention efforts, I believe it’s important to document what’s happening, and by whom, in any way we can. To that end, I’ve downloaded and made available the profiles of (almost) everyone on LinkedIn who works for ICE, 1595 people in total. While I don’t have a precise idea of what should be done with this data set, I leave it here with the hope that researchers, journalists and activists will find it useful. You can find the full data set, including profile photos, previous employment info, schools, and more, on this GitHub repository. 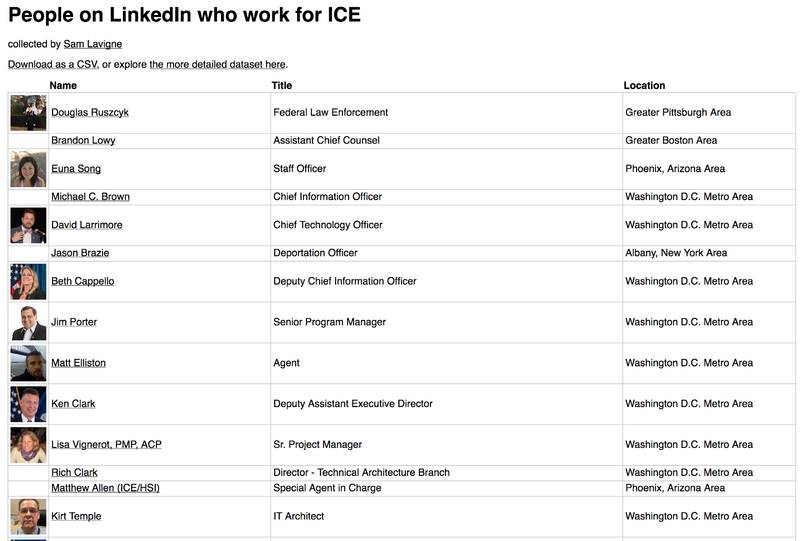 Details of each user are located in the “profiles” folder as .json files, each containing whatever information ICE workers have chosen to make publicly available about themselves on LinkedIn. You can also see a very simple overview of the data at https://antiboredom.github.io/ice-linkedin/ or as a csv file. I find it helpful to remember that as much as internet companies use data to spy on and exploit their users, we can at times reverse the story, and leverage those very same online platforms as a means to investigate or even undermine entrenched power structures. It’s a strange side effect of our reliance on private companies and semi-public platforms to mediate nearly all aspects of our lives. We don’t necessarily need to wait for the next Snowden-style revelation to scrutinize the powerful — so much is already hiding in plain sight. For those interested in downloading new data from LinkedIn, the GitHub repository also includes the Python code I used to scrape the platform (which is typically challenging), with some instructions on how to get it working. In the future I’ll post a more detailed tutorial about this, but if you have any questions, get in touch. Like what you read? Give Sam Lavigne a round of applause.